Being a student in 1996 vs 2012 – what will be different? So I’m going back to university next week! 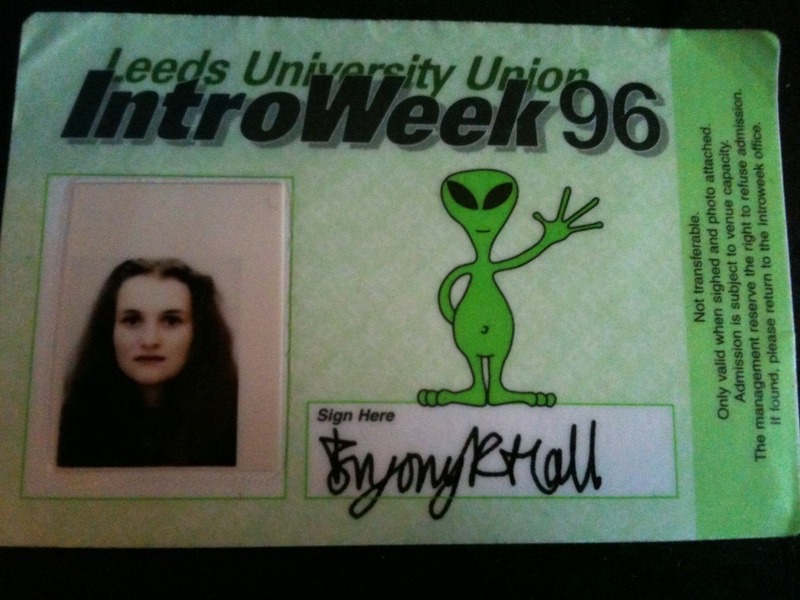 I did my first degree in Classical Civilisation at Leeds University from 1996-1999. I’m going to Cranmer Hall, Durham University next week to study for a BA in Theology and Ministry as part of my training to be a priest in the Anglican Church. One would have thought that 16 years wasn’t really that long a time. I think life at university between 1980 & 1996 was probably fairly similar but the gulf between my first experience of university in the 90s and now seems huge because of the digital revolution that has occurred since then! a mobile phone. I queued to use the payphone in halls with everyone else. a computer. I used the computer suites at the university – those in the Chemistry department were the best I seem to remember. We were forever leaving floppy disks in the machines! the ability to read journal articles electronically. If you wanted to borrow a single article you could. The library would have a certain number printed and you could withdraw them for one hour before returning them. an MP3 player. I had only just got my first CD player for my 19th birthday. I took loads of tapes to university. social media. The internet was new. I used Yahoo to find things. The internet then worked like a giant encyclopaedia but not much more than that. Email was barely used, it was a novelty. All of the above I can’t now imagine living without. I’ve been worrying that the wifi access in my halls at Durham might not be as fast as I’m used to! One of the random things I saved from my time at university were the post it notes we used to leave on each other’s doors. I guess this was proto-social networking really. This was before text messaging and Facebook and was the way we’d communicate short messages. Here is a selection, they’re very funny. Click on the pictures to enlarge. I was speaking to a student recently and they said they couldn’t imagine what it must have been like to go to university without Facebook! I have enjoyed the fact that I’ve already met quite a few of my fellow students at Cranmer Hall online on Twitter and Facebook. This just didn’t happen in 1996 – you went in cold. Freshers’ week was something of a nightmare of repeating where you came from, what you’re studying and what A-levels you did! I wonder if studying in 2012 will be much different than it was for me in 1996? I hope my feelings about Ancient Greek will be different this time around (see above image)! I think I’ll be much quicker at writing essays as I used to write them out long-hand and then type them up using two fingers. But then I didn’t have the distraction of social media and the internet whilst writing them! I’ll record anything I learn here! This all sounds very familiar! I was at Leeds from ’98-’01 studying Theology. I did my MA a couple of years ago and having access to online journals was amazing and it made me wonder how I’d managed without that back in ’98. I did have a mobile phone but didn’t use it much as it was too expensive. Test messaging was just starting but wasn’t very popular at that point. I actually found the computers in the Centre for Lifelong Learning (I think that’s what it was called) were the best as very few people knew they were there so I never had to wait for one to become available :). Good luck at Durham :). Thanks Moomin! I should have confessed that I did an MA at Leeds in 2003-05 and I too was amazed at being able to print off journal articles at home! God bless your studies, Bryony. The last time I was enrolled in my on-and-off pursuit of higher ed was in 2000. Language software, social research software with statistical crunching power… all had to be used on-campus. Most of my course texts were photocopied essay collections compiled by our professors; my German textbook was developed by the German Department, also photocopied. I’m still planning my return to school, but I need an online degree program. Thanks Karin! Slightly nervous about getting back into study mode but dead excited too! I’m sorry to tell you the wifi probably won’t be as fast as you’re used to…! I expect there have been improvements in the last couple of years but some of my friends only picked up the college network when the wind was in the right direction! Hope it goes well. I had an inkling that might be the case. It might help me read more though! Thanks. I’m struggling to cope with the fact that 25 years after starting at Uni in Aberystwyth, I’m back at college again! That was pre-CD, pre-internet, though we did have something called Bullet that worked on the computer systems that linked the universities. I didn’t know a soul when I arrived, but made life-long friends, and met my husband of the last 20 years! I expect to repeat some of those experiences again at Cuddesdon – though I don’t want a new husband! Like you we had a proto-social media system in our house called the ‘Fridge Quotes’ where we recorded all the memorable bloomers that we each came up with in conversation! I still have those scraps of paper too! This time, it’ll be Twitter, Facebook and blogging that will have to help me connect my ‘mixed-mode’ theological training to the rest of my life. I shall look forward to sharing our respective journeys to ordination from our respective training establishments. Me too Rachel! I’m still in touch with many of my uni friends and also met my husband at university. Yes, it will be interesting to compare our journeys at our respective colleges. Are you coming to the Christian New Media conference this year by the way? Not sure. There’s a fight between that, and spending some much needed time with hubby that day. Mind you, I’ve just looked at the theology stream and am really tempted now! WOW Bryony talk about a change in direction. I am sure you will do well. You will have to let us all know when you get to the end and become Ordained, because I am sure I speak for the others, we will all want to be there for you.